Singapore’s Changi airport has something green to boast about, which in time will turn other airports around the world green, with envy. The Green Market will fling its doors open on June 7trh at the Singapore’s Terminal 2, adding a greener shade to your air travel. Spread across 2,200 square foot, the pace designed by Hong Kong designer Kinney Chan, sports a green terrace and earth-tone colors. The lights have a tinge of greenery too. An eco-friendly air filtration Oxyvital system keeps the air clean at a molecular level. And to please your tummies before flights, the lounge has a Japanese menu, cooked-to-order meals. Operated by Plaza Premium Lounge Management, the Green Market can also be accessed for a fee by guests, regardless of airline or class of travel. 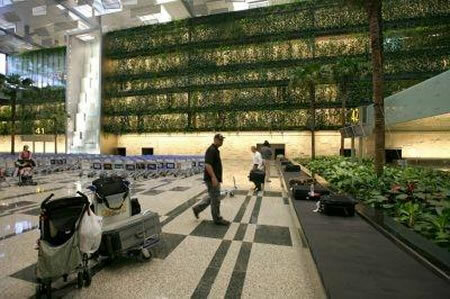 Voted recently as the world’s best airport, Singapore Changi has something more to flaunt and show off now.